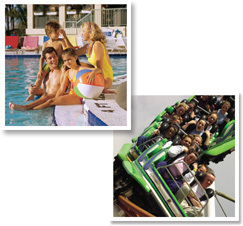 The "Orlando Fun Saver" Package makes that magical vacation to the Orlando area affordable. Now you can enjoy the exciting experience of Walt Disney World, Universal Studios, SeaWorld and so much more knowing that you have secured your lodging at a deeply discounted price. Your "Orlando Fun Saver" Package accommodations are located within minutes of all major attractions. This package includes 5 days/4 nights accommodations for 2 adults and 2 children up to 12 years of age and 2 adult passes to Disney or Universal. Room tax not included. All funds must be in U.S. dollars. **Add $25 per person, per night for holidays or less than 60 day notice. A visit to Central Florida would be incomplete without a visit to one of the many fantastic theme parks. Orlando offers many attractions that appeal to just about everyone. Bring your family to visit Orlando and make memories that will last forever! Executive Tour & Travel Services, Inc.